Set in a prime position overlooking Binibeca Beach and in a central location between the fishing villages of Binibeca Vell and Cala Torret, this property is a Spanish oasis. 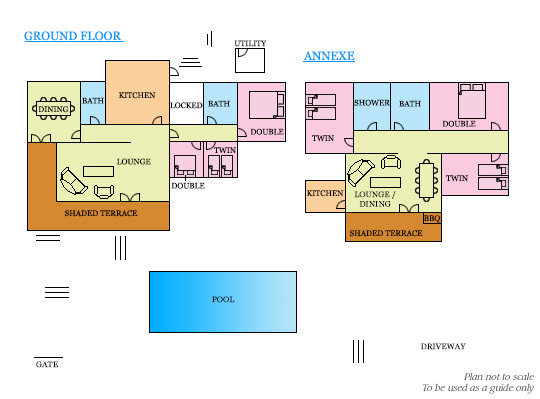 The house itself is divided into the main house and the annexe, both with 3 bedrooms and 2 bathrooms and a kitchen. Enjoy the fabulous sea views from the balconies. The house is surrounded by colourful flowers and a large lawn. WiFi and air conditioning/heating is included in the bedrooms. A superb spacious villa with sea views and 2 minutes' walk from Binibeca Beach! Villa Binibeca Beach has a private swimming pool surrounded by mature gardens and a grass lawn - the perfect place to soak up some sunshine on one of the sun loungers. There is an alfresco dining area built into the side of the villa - a great place to enjoy some tasty Spanish meals cooked on the brick BBQ. A set of 14 stairs lead up to the shaded upper terrace where you can enjoy some spectacular sea views towards Binibeca Beach. A gated entrance opens onto a private driveway with space for 2 hire cars and 13 steps leading up to the pool terrace. A separate pedestrian entrance opens into the villa grounds where there are 19 steps leading directly to the main house. The main house has a large terrace wrapping around the lounge and with comfortable seating and fantastic sea views. The lounge has sofas, a flat screen TV and feature fireplace. Patio doors mean that you can enjoy sea views from the lounge and also keep the interiors flooded with natural light. An archway leads to the dining room which has traditional decor and patio doors leading to the front terrace. The separate kitchen has white units and is well equipped to cater for all you holiday culinary needs. A doorway leads to 12 steps down to a separate utility room where the washing machine is housed. The main house has 2 double bedrooms and a twin bedroom, all with fitted wardrobes and are brightly decorated. All the bedrooms have windows offering marvellous views over the pool and towards the Mediterranean Sea. These bedrooms share a family bathroom next to the bedrooms. A second bathroom with a half bath is situated between the kitchen and dining room. The annexe is adjacent to the main house, built on the same level as the pool terrace, giving you direct access to the gardens and swimming pool through patio doors from the annex lounge and dining area. The annexe also has a well-equipped kitchen with granite worktops and wooden cupboards. There are also 1 double and 2 twin bedrooms, with access to a shared shower room and bathroom. Tourist Licence Application Number: Inscrita. Just 2 minutes' walk from the exquisite sandy Binibeca Beach and in-between Cala Torret and Binibeca Vell villages, this villa is in a fantastic location. With a selection of bars, restaurants and shops within a few minutes' walk and a bus stop with 5 minutes' walk, this villa is ideal for those not wanting to drive on holiday. If you want to explore the island further, then San Luis is just 10 minutes' drive away with bars, restaurants and traditional white-washed houses. Our villas Paradis and Margaritas are next door. The Binibeca area has small mini market for daily essentials. A larger supermarket can be found in San Luis, a 10 minute drive away. In the fishing village are some lovely quaint souvenir shops selling local crafts. The village of San Luis also has a weekly market and fresh fish and meat. Stroll along to the Binibeca Beach where there is a beach bar where you can enjoy a cool refreshing drink or have a bite to eat. Binibeca Vell also offers a wide selection of places to eat, from tapas to fresh fish restaurants. The centre of Cala Torret is just a 10 minute walk from the villa with plenty of restaurants overlooking the coastline as well as a bakery - perfect for fresh bread or morning pastries. The popular sandy Binibeca Beach is just across the road, giving the villa its name. This beach is ideal for family days out with a small wooded area at the back with picnic benches. Top up your tan on one of the sunbeds available for hire in peak season or hop on a pedalo for more excitement. The neighbouring resort of Punta Prima is home to 1 of the islands 3 waterparks, Splash. Or, head to Lloc de Menorca Zoo 20 minutes' drive away. The zoo is home to a range of creatures from farm animals to more exotic animals. Binibeca Vell is a traditional fishing village just 15 minutes' walk from the villa, with authentic whitewashed buildings. This village is one of the most photographed spots in Menorca and a great place to immerse yourself in Spanish culture. A visit to the capital Mahon is well worth the trip, just a 15 minute drive away and with a magnificent harbour as well as an excellent selection of restaurants, bars and shops. The islands only golf course is in Son Parc on the North Coast, around 40 minutes' drive from the villa. Menorca has a fabulous walking and cycling route called the Cami de Cavalls, a bridle path which circumnavigates the whole of the island. Don't forget your camera to capture the stunning coastal views. Monte Toro is the islands highest peak with fantastic views at the top, 40 minutes' drive from the villa. Villa Binibeca Beach is not available to book for season as it is sold out. Take a look here at the Menorca villas that are currently on sale.